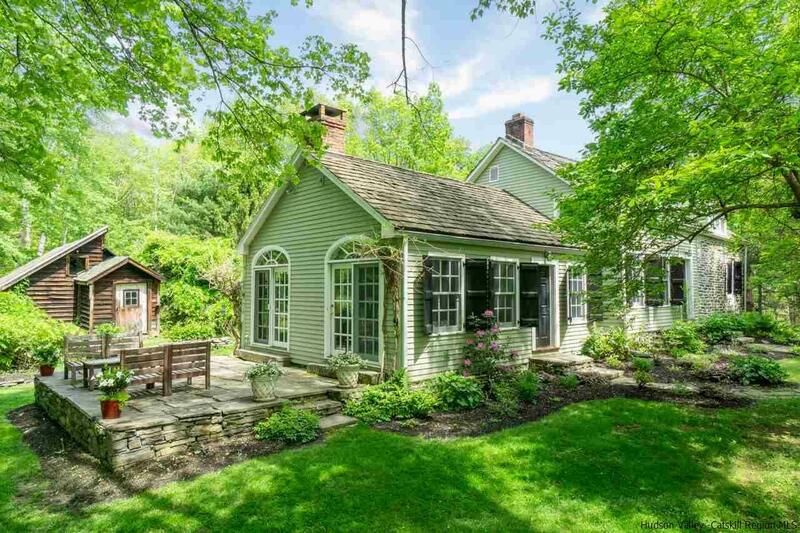 Sited on a quiet country road amid 29 acres of old growth forest and open meadow, and on the banks of a woodland pond, this sophisticated ca.1800 stone farmhouse with later wood-frame additions is the quintessential Hudson Valley getaway. Original wide-board floors, exposed beams and period detail abound. There are wood burning fireplaces in the living and dining rooms, as well as the lower level study, currently being used as a fourth bedroom. The well-outfitted kitchen with vaulted ceilings features a true commercial Wolf range with griddle and salamander, as well as a useful island and plenty of storage. The adjacent dining and sitting areas make this a space where friends and family will want to gather by the wood stove or gaze at the magical property through an abundance of windows and French doors. When the warm weather comes, there's a heated gunite pool to splash around in, an outside shower, stone walls and woods to explore, and the vast pond and its birdlife. The vintage chicken coop is great for storing gear and garden supplies and could make a great studio, meditation space or maybe even a guest cottage.